Check for vehicles only in the direction that you plan on going, then proceed. Let all vehicles that arrive before or after you go first. Check for traffic in all directions before proceeding. 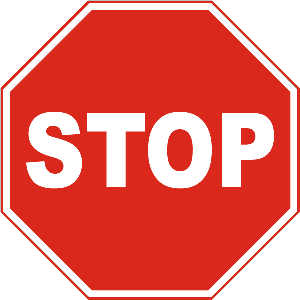 At a stop sign, you must come to a full stop and check for traffic in all directions before proceeding. See both headlights of the passed vehicle in your rearview mirror. When passing is permitted, look for both headlights of the passed vehicle in your rearview mirror. Only then may you safely return to your original lane. Slow down and use your low beam headlights. Slow down and use your high beam headlights. Turn your lights on and off to warn other drivers. When driving in fog, you should slow down and use your low beam headlights. If the fog is so bad that you cannot see, pull off the road and wait for the fog to clear. Alcohol reduces all of the important abilities you need to drive safely. Alcohol goes from your stomach to your blood, then from your blood to all other parts of your body. Alcohol affects the areas of your brain that control judgment and skill. Passing on the right is permitted when the way ahead is clear. Passing on the left is permitted when the way ahead is clear. A broken yellow centerline next to your side of the road indicates that traffic may cross the centerline to pass from your side of the road. Which of the following are factors commonly contributing to traffic crashes? Exceeding the posted speed limit and driving too fast for conditions or circumstances. Getting adequate rest and staying alert. Scanning the environment and staying focused on the driving task. Driving above the speed limit, driving too far below the speed limit, and driving too fast for conditions are all actions that commonly contribute to traffic accidents. Always drive with the general flow of traffic, within legal speed limits. Only when used on an interstate. Only when operated by a minor. The Alabama Mandatory Liability Insurance Law says that no person shall operate, register, or maintain registration of a motor vehicle designed to be used on a public road or highway unless it is covered by a liability insurance policy. This protects consumers when they are involved in an accident. Turns sharply right, then left. 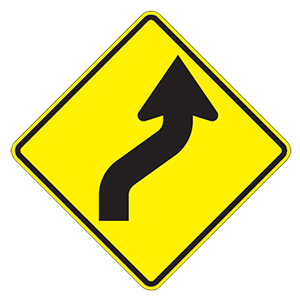 This sign warns of a reverse curve in which the road curves to the right, then to the left.